"Well, where the hell is over there?" The jocular, stimulating and illuminating Florida Tarpon trip presentation by Les Junge and Richard Holubek at the June meeting inspired me. 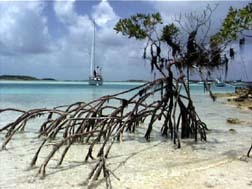 Many of their episodes paralleled experiences on the Bahamas trip. I was really surprised to hear Les and Richard speak about how the Florida guides referred to where Tarpon were: "He's over there", or "there he is." Well, where in the hell is "Over there"? In my past experiences with the Florida guides they have been most explicit; "2:00 o'clock at seventy feet, a pod of six fish"undefinedusing 12:00 o'clock as directly off the bow of the boat, etc. Rich and I experienced the "Les scenario" with some of the Bahamian guides. By the time we searched in front of the vessel from ten feet out to the horizon in a 180° arc, then looked at the guide, then in the direction the guide was peering, the fish were under the boat or long gone. With the wind, the clouds, the chop on the water and the boat being pushed, casting expertise became a premium factor. When fish were finally spotted, they were frequently close to the boat giving one little time to roll cast, possibly one false cast and then lay the fly down. Considering the closing time and speed of the fish if one did make a false cast the fish had frequently gone by, making a presentation to the 8:00 or 4:00 locations necessary, which usually resulted in lining the fish. The casting factor is really the main reason for this article. Perhaps you'll remember that I've written in the Flyer about casting before. Many on the Bahamas 2002 trip declared that they would have better casting skills on future trips. If we wait until we get to the bonefishing flats or other outstanding fishing areas to hone our casting skills in abominable conditions, as described above, catching will be nil, but negative thoughts will not. At the PFF's June casting session many were given a much sharper idea of what casting is all about. Thanks to Rich Catanzaro, Ken Eugene, Ron Kilgren, Bob Shadle who were with me were to assist those in attendance. Give some serious thought to becoming a better caster. Is it worth spending your hard earned dollars to go on an expensive fishing trip and winding up with just a boat ride because conditions overcame your casting capabilities? Believe me, I had my own casting difficulties this past trip, but I made some sound casts under extreme conditions, casts that resulted in hookups, possibly several more fish caught. Isn't that why we go on trips, to catch fish?